Two fabulous films from the Yorkshire Film Archive website, following on from the page on the factory clocks of Rowntree’s and Terry’s. These films show the factory buildings and the workforce at both, the people those clocks once served. The workers at Rowntree’s who might be glancing up at their clocks at the gate, the workers at Terry’s who would have been able to see theirs from many streets away. 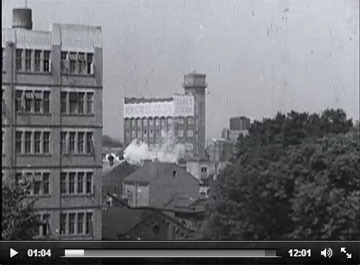 Workers clocking in, and later running out perhaps, according to the Rowntree’s film below. But first, here’s a (silent) film of the Terry’s factory. Well, actually it’s a film of a royal visit, in 1937, but I spent all my time looking past the royal party at the workers in their uniforms, and the massive building they streamed out of and stood by. The scale of the thing. Because it’s familiar we perhaps don’t appreciate, walking past it on the street or seeing photos, just how vast a place it was, how many people it employed in its heyday. This is clearly represented in several places in the film in particular, at 2 mins 50, for example, and at 3 mins 45, so many faces at the windows, and at 5 mins. Followed by a rather less interesting sequence of presentations to the royal visitors. But then enlivened again as the royal party leave and the formal bit relaxes behind them and the women nearest the camera lose their line and momentarily huddle and talk in spontaneous excitement, a lovely moment at around 9:59, then the men in bowler hats look relaxed and normal and immediately smoke, while perhaps saying ‘That went rather well I thought’ to one another. While they’re all relaxed it’s all kicking off at the Mansion House, with police holding back the enthusiastic flag-waving crowds, illustrated in the last couple of minutes. Marvellous stuff. That this was filmed is nice. That it was preserved for so many decades is even better. That it’s available to view for free online is splendid. With added ‘Context’ and the opportunity to comment. And on to Rowntree’s, the following decade, just after the war. 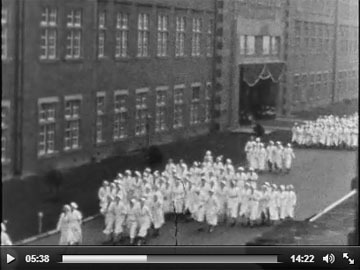 Women workers running en masse from the factory entrance. Filmed from closer to the natural level, more personal and small-scale and rather more Rowntree-like, fittingly. They all look very fit, and they’re heading for their sports day, which is the main subject of this film. But again, I was looking behind them, to the buildings they knew and worked in, some of which remain, most of which are gone now. From 1 mins 45 we’re at the sports day, losing the lovely voice and natural style of the original voiceover, and going into a more staged commentary style, amusing now. With poetic moments almost. Worth a watch/listen. It’s charming, and of its time. Stills from the films used with permission. Marvellous – thanks for finding and sharing. So many factory workers, all dressed alike! It reminded me of a passage from E.V. Morton’s “The Call of England” (1928) where he describes seeing Coney Street in the early evening, suddenly ‘flooded by thousands of small, smart girls’ when the chocolate makers leave their factories. My Wife & I worked in the Card Box Mill. I worked at Rowntree’s 1946-70. Immigrated to Canada 1970.Worked a short while at Rowntree Canada.